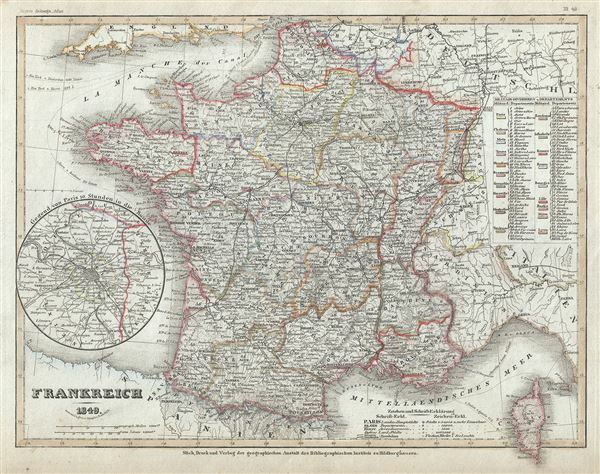 This is a fine 1849 map of France by Joseph Meyer. It covers the Kingdom of France showing its various provinces. It covers from the Flanders in the north to Roussillon in the south and from Brittany in the west to Alsace in the east. It covers from the Flanders in the north to Roussillon in the south and from Brittany in the west to Alsace in the east. Also includes Corsica. An inset on the bottom left quadrant details Paris and its vicinity. This map lists the 86 French departments along the right border. It covers France just prior to the December 2, 1851 coup d'etat that brought about the Second Empire. The Second Republic transformed into the Second Empire, established by a referendum on November 7, 1852. President Louis-Napoleon Bonaparte, elected by the heavily Bonapartist French people, officially became Napoleon III, Emperor of the French, from the symbolic and historic date of December 2, 1852. This map was issued as plate no. 49 in Meyer's Zeitung Atlas. Although all the maps in this atlas are not individually dated, the title page and maps were often updated while the imprint with the date was not, causing confusion to the exact date for some of the maps. Moreover some maps in the atlas were taped in at a later date as an update to the atlas. We have dated the maps in this collection to the best of our ability.